For the second time ever, Delaware has an entry in the American Association of Community Theatre festival. 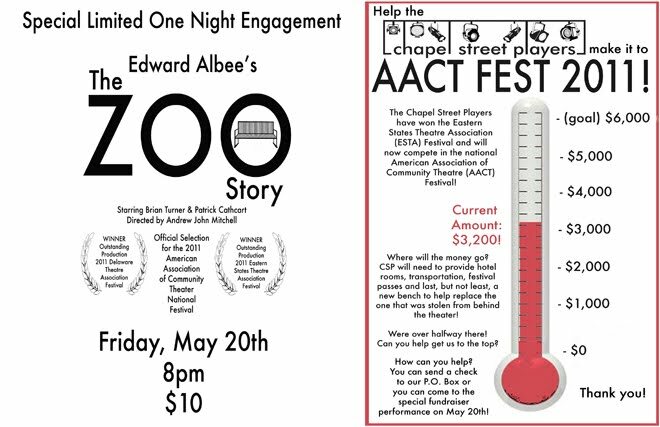 Andrew Mitchell directs Brian Turner and Patrick Cathcart in Edward Albee’s Zoo Story – a one-act story about human contact in a New York City park. Patrick Cathcart plays Jerry, an edgy, nervous guy who has just about given up on positive contact with all living creatures when he spies Peter, a happy, humdrum middle class father of two girls with his happy middle class job, middle class home and middle class habit of sitting on a park bench and reading every single weekend. Cathcart is so completely Jerry that he has that wild and hungry look as he starts up a conversation with the reluctant Peter. His jerky gestures and perfect New York accent are exactly what you heard on the subway platform on your last trip to the city. Jerry teases and cavorts with Peter so engagingly that Peter is soon lost in the threads of Jerry’s life and couldn’t get away if he had to. The result is a maelstrom of emotion and events, which Director Andrew Mitchell and the two actors have polished to perfection. They compete on Friday, June 24, 2011 at the Geva Theater in Rochester, New York. Whether they win or lose, Delaware theatre lovers can be very proud of the excellent representation in the national event. Patrick Cathcart won Best Actor as of twenty minutes ago. Brought home the gold!